Easy Coconut Macaroons. 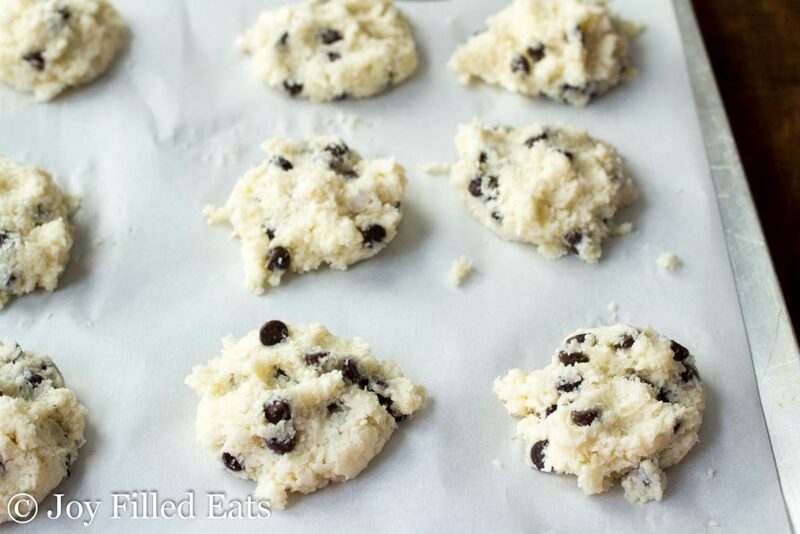 These can be your new go-to easy baked good. Six ingredients. Five minutes to mix and scoop. Thirty minutes to bake. Done. One dirty bowl and two dirty cookie sheets. And a measuring spoon or two. That’s it. I even simplify further and line my cookie sheets with parchment paper but that’s optional. I’ve been working hard on cutting back dairy in my diet. My easiest switch was beginning to use cashew or almond milk in my coffee in the morning. Harder is giving up creamy desserts and cheesy dinners. I’m trying to do one or two dairy-free meals a day in the hope that it will help me break my weight loss plateau. 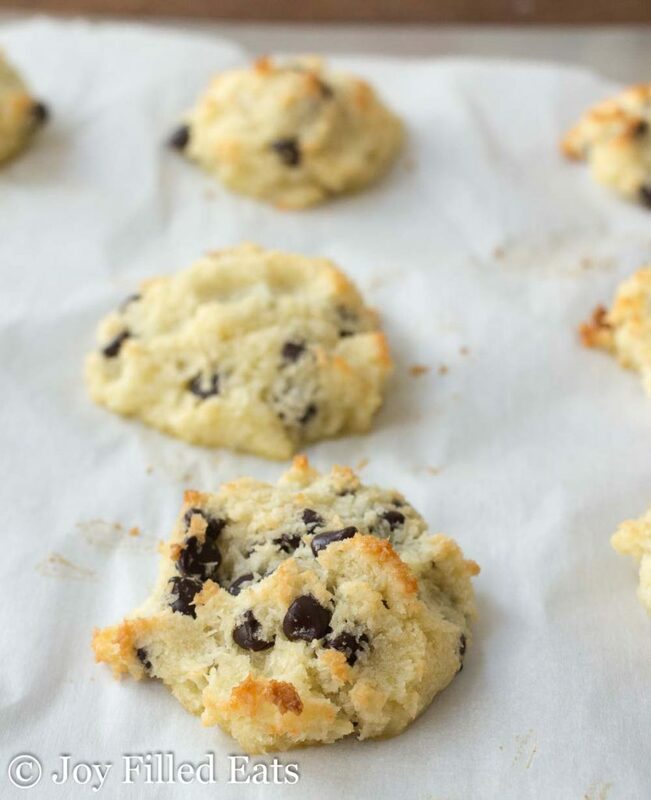 Having a dairy-free dessert like these Easy Coconut Macaroons on hand is a must in my book. One that mixes up in just 5 minutes is even better. I always use parchment when baking cookies just for the ease of clean up. I buy one huge pack at Costco and it lasts me years even with all the baking I do for this blog. I highly recommend it! When I first published this recipe I just put 8 oz of finely shredded coconut because that is a standard measurement and then you can just dump in the whole bag. A lot of people translated that to 1 cup of finely shredded coconut. Not the same thing. Coconut is light and fluffy so 8 oz of coconut is actually 2 1/2 cups. 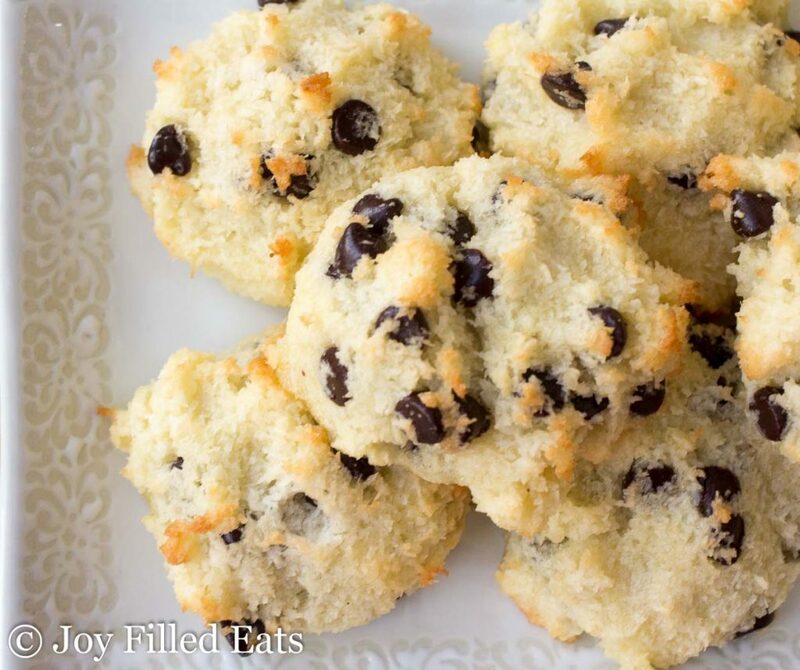 You can leave the chocolate chips out for plain macaroons, add some nuts, add your favorite extract, and easily adapt this recipe for your own family. Last time I made these Easy Coconut Macaroons I made half the chocolate chips and made the other half into Triple Chocolate Macaroons with cocoa powder, chocolate chips, and a chocolate drizzle. Mix together all the ingredients until well combined. Drop 24 heaping tablespoons onto 2 cookie sheets. Bake for 30 minutes or until the edges are golden and the cookies are slightly firm to the touch. They do freeze well. I'd suggest wrapping them one or two at a time in plastic wrap and then putting in a large ziploc bag. 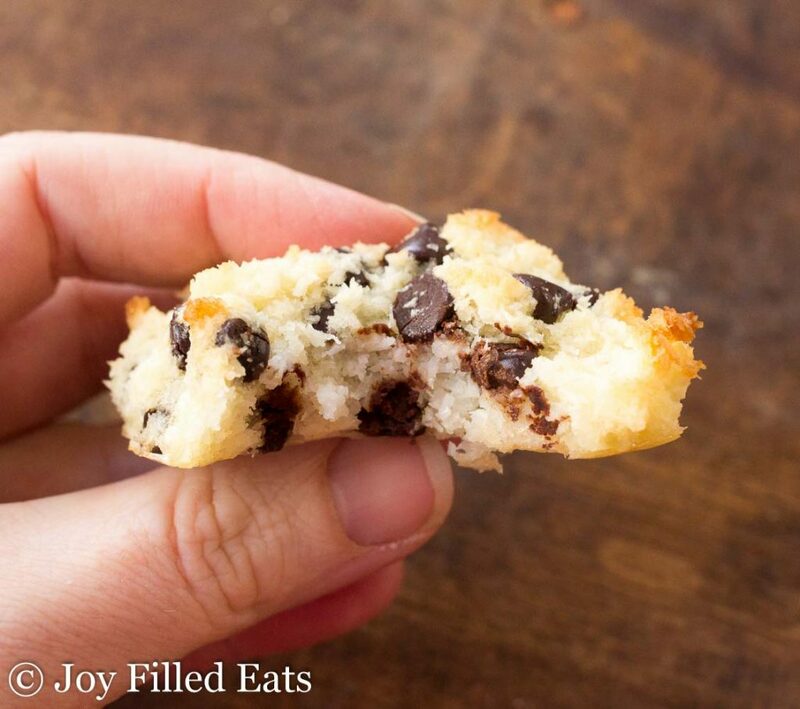 I am a chocolate chip fanatic, can't wait to make these! Yum I love that these macaroons are so easy to put together! Big fan of coconut so pinning these to make next baking day. Tried this today to take to a bday potluck. The taste was delicious but they came out flat and crumbly. Ugh. But these were tasty and I tried the 2nd batch with added cocoa powder. They’re baking right now so hope these don’t flatten like the first batch! Will update later. Did you use finely shredded coconut? Yes I used finely shredded coconut. The 2nd batch still came out crumbly and flat as a pancake. I let them bake for 15 mins then watched until the edges would turn brown and still felt like it was pretty crumbly. I followed the recipe exactly. Was disappointed they didn’t look like the pic. Not sure why this didn’t work out. I'm not sure. Did you use a full 8 oz bag of finely shredded coconut? 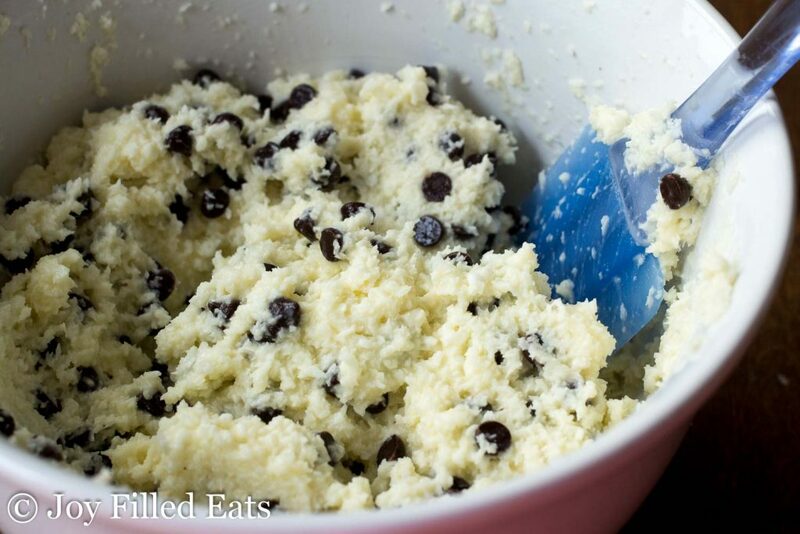 What did the dough look like when you scooped it? Like my photos? If I want to use just egg whites to keep the pure white color, do I use the same amount of eggs? Or should I add one more? I would add one more. So easy and so tasty! Brought them into work and they were a big hit. I'm making my second batch now. 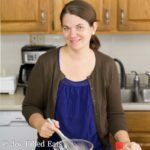 Not sure if this will matter or not, but every single recipe for coconut macaroons I've seen uses only egg WHITES for some reason, yours uses all of the egg including yolks. Any idea why it works in yours and not in others? So annoying separating eggs and yolks anyway isn't it? You can definitely use whole eggs in macaroons. I think most macaroon recipes call for just the white so the macaroons are pure white. That is not something I care about (they just need to taste good!) so I go ahead and use the whole egg. wish I could post a pic here but macaroons are in oven with the coconut milk spreading out in a puddle around each one! any idea why this is happening? seemed like an awful lot of liquid in there to me I noticed when mixing. Thanks~! Did you use FINELY shredded coconut? It has to be fine or they don't absorb all the liquid. 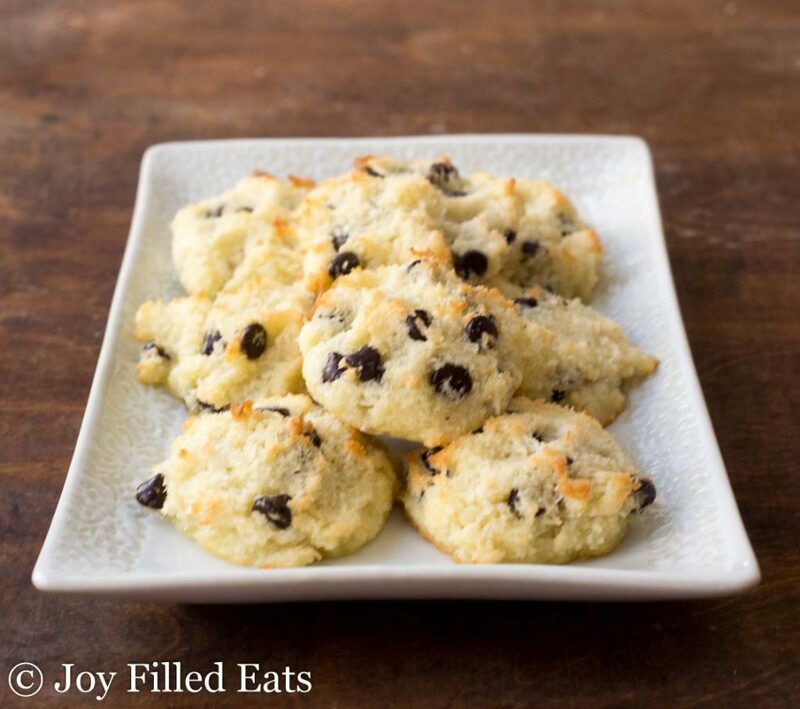 You can email me a pic at taryn @ joyfilledeats.com but they should be yummy anyway. My magic cookies lose a little liquid as they bake and they are still great. WOW!!!! I am SERIOUSLY impressed! I made these today and just ate one....oh I am soooo happy! I used stevia to make them, used the amount suggested in the recipe and it is sweet enough for me. THANK YOU FOR THIS TASTY RECIPE!!! These are terrific!!!! I made them exactly as written, for a friend who can't eat gluten or dairy. I didn't think I'd like chocolate with coconut, but they're really good. I WILL be making them again and again. Thank you for this recipe! Hi, I don’t hv coconut flour. Anything else I can replace with? You can use almond flour but use twice as much. We love these! So happy to have found the recipe! They are the perfect treat to have in the morning with my hot tea! Thanks so much for sharing! These look delicious, I can’t wait to make them tomorrow! I’m curious, how much super sweet should I use instead of gentle sweet? Hi Jan, the sweetener is linked to in the recipe card. If you click through you can see photos of it. The 2 sweeteners I recommend come in granular form. They are twice as sweet as sugar. I hope that helps! Has anyone tried these with Swerve powdered or granulated? If so, how much did you use? If you use swerve you will need 1.5 to 2 times the amount listed. It is not as sweet as the sweetener I use. I used 1:1 powdered Swerve (1/3 c. )and they turned out perfect. Did not use chocolate chips, did not affect turnout at all. Great recipe, will make again. I would love to try this! I can't have eggs. Is there something I can substitute? Flax eggs? Thank you! Hi Gloria, I think coconut sugar would work but you may need to add more to get the same level of sweetness. Would it work if I used regular sugar (organic, turbonado, etc)? I don’t have the other stuff but would love to try these out. Hi Chelsea, regular sugar should work in these but you will need more than the amount called for. 1.5 to 2 times as much. AMAZING! I love this recipe. 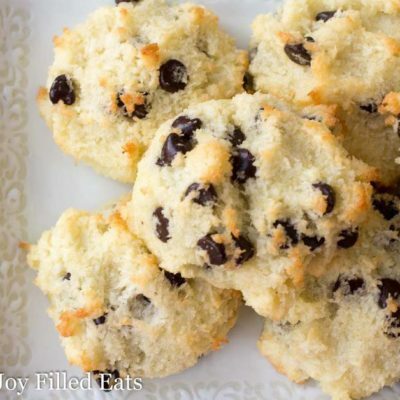 It is truly easy to make and they taste delicious, soft with just the right amount of sweetness. The results were picture perfect. I posted a picture on Pinterest (cookies on a plate) to show you how perfect your recipe really is. My 15 year old THM teen loves these as well. They go great in a school sack lunch. Do these need to be refrigerated?And how long will they keep? I think they would be ok at room temp for a day or two but will keep longer in the fridge. Up to a week. I've frozen them for months too. So you have a lot of options! I've left them out for up to a week...they don't last any longer than that, lol...in a sealed plastic container and they were fine. Could you use stevia for the sweetener? Maybe. You would have to cut back on the liquid since the cookies would have less bulk. Did you try with stevia? If so what did you change up and how much stevia did you use? Should the water in the canned coconut milk be added? Yes, dump in the whole can. It is just the thinner part of the coconut milk that has separated. 8 oz is 1 cup. So how much coconut does this recipe call for? 8 oz is not always 1 cup. Coconut is light and fluffy so 8 oz of coconut is actually 2 1/2 cups. 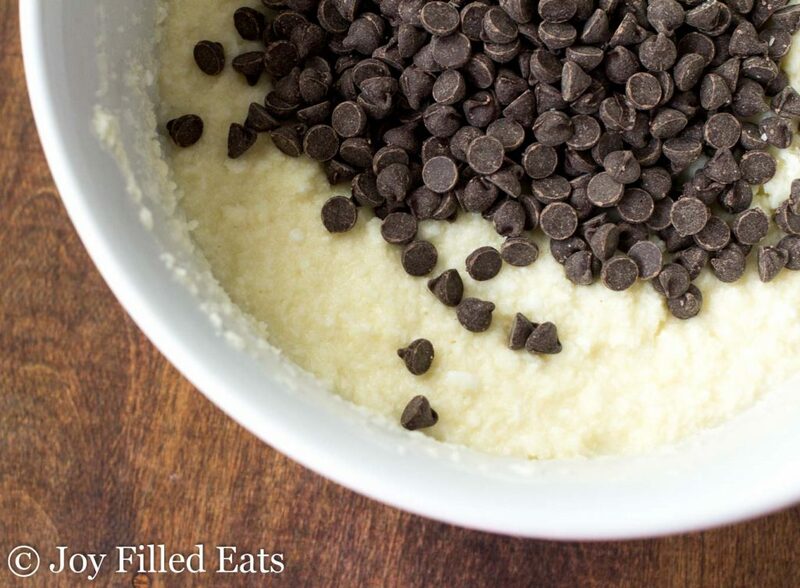 This recipe calls for 8 oz of finely shredded coconut. These are so moist and delicious. Thank you! Having a huge family gathering at my house for Fathers Day, and didn't want to be tempted by the traditional desserts. Plus my brother in law is diabetic. So I made these tonight, and I already can't stay out of them. They're yummy! And husband-approved! Could I replace the coconut milk with anything? I don't have the coconut milk on hand, but am eager to try these! We can have dairy so any dairy product suggestion would be fine! Hmm.. maybe half the amount listed in heavy cream. So I just made this.. it was baked in 15 min at 350.. the only reason I can think it didn't take 30 min is I used parchment paper? Hi Nicole, I'm not sure why yours baked so fast. I'm going to put a note in the recipe to start checking at 15 min. A few other readers have given me great feedback on these and didn't mention needing to reduce the baking time. I'm glad I read this before I baked mine. I used parchment paper & mine were also done in 15 minutes! They are so simple & taste great! Did you use unsweetened or sweetened coconut? Thanks! Unsweetened. I used an 8 oz bag of finely shredded unsweetened coconut. Perfect. I was hoping it was unsweetened. Thanks! Just whipped up the batter and I love how delicious and easy it is! Only thing is that my batter is very liqidy and is definitely not scoopable. I converted the 8oz of shredded coconut to one cup. Is that right? And I know coconut products can really vary. I used trader Joe's coconut milk and natural grocers coconut flour. Already added another tablespoon of coconut flour and 2/3 cup more shredded coconut but it's still runny and definitely not scoopable or as "dough like" as your picture. Any ideas? Hi Emma, 8 oz of coconut is closer to 3 cups. I think my 8 oz bag said it was about 2 3/4 cups. I use 3 & 3/4 cups coconut which is perfect...I may try a bit less next time and see how that works seeing you said 2 1/c ups in the recipe. Also, are these a THM S? I tried cutting back on the Gentle sweet but will use the amount that is said in the recipe...just not sweet enough for me! This recipe is so easy and deelish! Thank you! I use 3 & 3/4 cups coconut which is perfect...I may try a bit less next time and see how that works seeing you said 2 1/2 cups in the recipe. Also, are these a THM S? I tried cutting back on the Gentle sweet but will use the amount that is said in the recipe...just not sweet enough for me! This recipe is so easy and deelish! Thank you! Hi Marie, I'm glad you liked them! Yes, these are an S.